Gourmet Chai Tea with T.A.G.G. 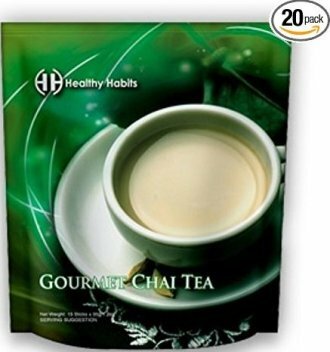 Healthy Habits Gourmet Chai Tea is infused with T.A.G.G. Tongkat Ali extract, Ginseng extract and Ganoderma extract. Our proprietary blend delivers over 4000 years of Chinese herbalism in every single cup. If the health benefits have not caught your attention the taste surely will. Our Chai is surely a sophisticated treat! Let the aroma draw you in and you will find yourself enjoying aromatic sip after aromatic sip of delightful herbs and spices. Ideal for the weight conscious. HHG Chai Contains 20 Individual servings per bag. Our exclusive proprietary blends and flavors will tempt your senses while providing many of the nutrients you need to get through your busy day. Healthy Habits has spared no expense in the development and manufacturing of our product line. Our manufacturing facility meets and exceeds the highest standards in quality assurance and you can rest easy knowing we take great pride in the safety and quality of our products. Sugar, Creamer (Glucose Syrup, Vegetable Fat, Sodium Caseinate (Milk Protein), Stabilizer, Emulsifier & Anticaking Agent), Instant Black Tea, Tricalcium Phosphate, Eurycoma Longifolia Extract, Ganoderma Extract (Reishi), Ginseng Extract. With the addition of Tongkat-Ali and Ginseng, Healthy Habits has supercharged the raw power delivering 154 Antioxidants and over 200 phytonutrients that promote the body's ability to function in an optimal state in a single serving. Our exclusive proprietary blends and flavors will tempt your senses while providing many of the nutrients you need to get through your busy day. Healthy Habits enriched coffee line consists of Gourmet Black, Gourmet Blend, Gourmet Cappuccino, Gourmet Chai tea and Gourmet Hot Cocoa. We encourage you to try one of our flavors! The distinctive asset of our coffee line is that they are available to you anytime, anywhere, through our unique delivery system… single serve packets. You can put them in your pocket, purse, gym bag or even take them on a plane. You will never be without your Healthy Habits Coffee no matter where you are.